Property 29: Silver Street Studio - Creative, Eclectic, Artistic, Retreat: Perfect getaway! Wright Street Cottage. Close to the City/Stadium! Property 31: Wright Street Cottage. Close to the City/Stadium! Property 36: Beautiful & spacious home. 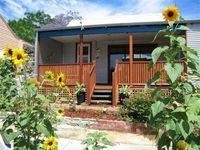 10 min from Perth CBD! Property 38: Mulberry Mansion - Fremantle. A resort style holiday home. Property 39: HERITAGE on BURT - Fremantle Arts Centre Location. Property 40: Freostays' Kottaj- fully self-contained, shady, central and quiet. DIRECT ON RIVER-FRONT! 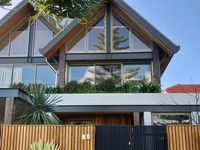 - FREMANTLE ARCHITECT HOME - PLUS 3 MIN WALK TO BEACH! Property 48: DIRECT ON RIVER-FRONT! - FREMANTLE ARCHITECT HOME - PLUS 3 MIN WALK TO BEACH! What a stunning house. Architecturaly beautiful and so comfortable to call home for the week of our stay. Location made for ease of daily routine... 100m stroll to the beach.... 100m stroll to groceries and pharmacy. A ten minute drive to Claremont Quarter to pick up Aussie fashion. Bus and train service available on your doorstep would be useful for some. House is well appointed and cooking for my family was a delight with the glass back of the house opened up to let the beautiful dappled light and seabeeeze in. Beds were super comfortable. The master bedroom has no blinds but I actually work before the sun rose and enjoyed watching the skies transition from night to day from the comfort of my bed. All other bedrooms have blackout blinds. The house has been beautifully decorated with attention to its purpose. Local artwork makes a fabulous addition especially for us as &lsquo;ex-locals&rsquo; identifying the locations. Wifi worked perfectly. Cannot imagine staying anywhere else when we next visit Perth. A superb house that is well managed.